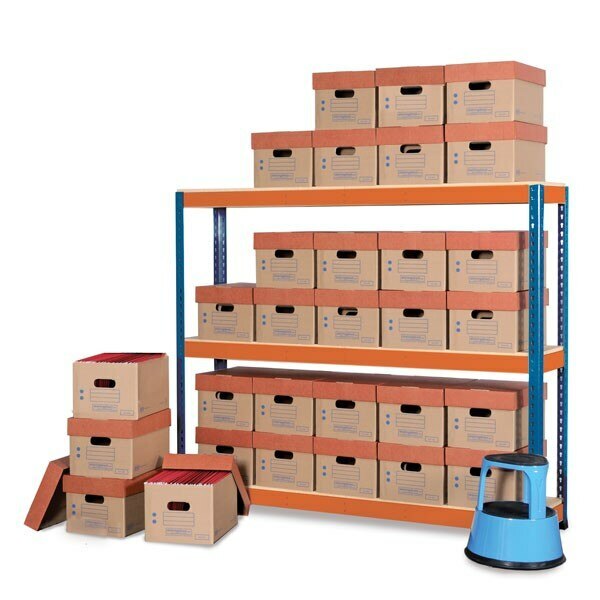 This boltless heavy-duty shelving model holds two boxes vertically per level, so fewer shelves are needed to achieve high storage capacity. This option is more cost-efficient than the "Quick Access" alternative. You can store from 16 lidded cardboard boxes on only two shelving levels, up to 70 boxes on five levels. The boxes included are high-quality and are made with a high percentage of recycled paper. Economy Kits bring savings while keeping direct access to every box on the shelving unit. 200 lb tested environmentally friendly boxes. PRO2 corrugated document file boxes included. Also available without boxes. Boxes/Bins Quantity: 16, 20, 24, 28, 32, 36, 40, 42, 48, 50, 56, 60, 70.